On the Domain, almost across the road from Government House, lies a ruin. I had lived in Hobart for a number of years before I actually stopped and paid attention to the area. The metal gate shouts Beaumaris Zoo to passers-by, but who stops anymore? Is there even anything to see? Truthfully? Not really, but that doesn’t take away from the significance of the location. It was here, on 7 September 1936 that the last known Thylacine died; likely the result of neglect and exposure to the Tasmanian elements. The disappointing factor surrounding this is that the animal died less than two months after official protection of the species was legislated on 10 July 1936. Whilst there had been calls for the protection of the species for decades before this, the final outcome came too late to save them. Beaumaris Zoo didn’t last much longer, closing the following year in 1937, having been in operation at the location on the Queens Domain since 1922. The zoo itself went back to 1895, a private collection owned by Mary Grant Roberts. Mrs Roberts was a socialite, married to Henry Llewelyn Roberts whose success in business allowed his wife to engage in her passion for collecting and caring for animals. The zoo was originally opened to the public on the land the couple owned between Newcastle Street and Sandy Bay Road in Battery Point. Whilst the house still stands, the grounds have since been developed into apartments, leaving the view of the original property obscured. Despite having no training, Mrs Roberts’ passion and skill in animal care allowed her to see the zoo thrive. In 1910, she “was asked by Mr. A. S. Le Souef, Director of the Zoological Gardens in Moore Park, NSW, to obtain, if possible, Tasmanian Tigers and Devils,” and in April 1911 she received her first Tasmanian Devil family, consisting of a mother and four joeys, allowing her the opportunity to observe “their growth almost from their first appearance when partly protruding from the pouch.” This family was later sent to the London Society, and Mrs Roberts received her second family in September of the same year. In 1913, Mrs Roberts became the first person to breed Tasmanian Devils in captivity. Her paper The Keeping and Breeding of Tasmanian Devils (Sarcophilus harrisi), was published in the Proceedings of the Zoological Society of London in December 1915. In it, Mrs Roberts spoke about the relationship between “Billy” and “Truganini,” and Truganini’s subsequent maternal care of the newborn joeys. The original litter, sadly, did not survive; however, the following year saw greater success in the survival of Truganini’s second litter of joeys. Mrs Roberts’ paper gave a clear indication of her passion for the Tasmanian wildlife, and how much she came to love her Tasmanian Devils in particular. She took great pains to clarify in her paper how the character of the Tasmanian Devil had been misunderstood and misconstrued. Upon Mary Grant Roberts’ passing in 1925, she left her entire estate to her daughter, Ida Roberts. Ida, with other members of her family, first approached the Trustees of the Royal Botanical Gardens and the Tasmanian Museum and Art Gallery to take over the management and maintenance of the zoo. The ongoing maintenance costs associated with managing such a project, though, were beyond the reach of the Trustees, and it was only through negotiation with Hobart City Council and the Tasmanian state government that a plan was able to be reached for the Council to host the zoo at its final site on the Domain. Appointed as curator was Mr Arthur Reid, a Scottish-born migrant to Tasmania, who was responsible for expanding the zoo beyond a private collection of Tasmanian native wildlife into a spectacular feature. Upon receiving his appointment, Reid embarked on a tour of zoos around Australia to determine the best and most modern animal keeping methods of the time. Under Reid, animals from other continents were added with lions, elephants, and polar bears some of the features alongside several species of monkey, prairie dogs, and in later years, a leopard named Mike, who became a common site outside the zoo grounds, being walked on a leash by Reid’s daughter, Alison, through the Queens Domain. Beaumaris zoo was a site of conservation, both during the days where Mary Roberts owned it, and after it was taken over by the Hobart City Council. In these days of the early 1900s, the exceptional value of the animals humanity share the planet with was just beginning to be realized. Upon auditing of the animals at Beaumaris in 1922, Arthur Reid noted a total of 48 animals in the collection, and 100 birds. Mrs Roberts’ Tasmanian Devils had not survived, and the lone Thylacine in the collection had fallen into ill health. It died of pneumonia in October of 1922 before the Queens’ Domain site could be completed, and the call was placed for a replacement. The Queens Domain site was finally completed in January 1923, and on February 1, the animals were transferred from the Battery Point location to the new site. The following day the Zoo was officially opened, albeit missing the highly anticipated African Lions due from Taronga Park Zoo in Sydney. The opening ceremony, hosted by Alderman W. M. Williams in place of the mayor, allowed free entry to the zoo for that afternoon only. The Zoo stood on the Domain for the next fourteen years, before it finally succumbed to financial difficulties in 1937. The site was sold to the Royal Australian Navy, who used it as a fuel storage depot from 1943 to 1991, at which point it was returned to the Hobart City Council. The Ghosts of Fur and Feathers gate that currently keeps watch over the entry to the site was installed as part of National Threatened Species day on 9 September 2000, appropriate, given that within these walls was taken the last known breath of one of Tasmania’s most iconic animals. 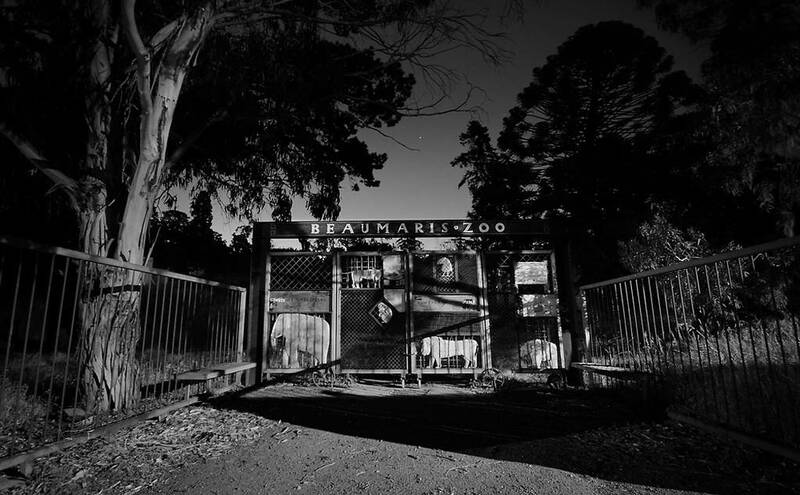 The ghosts of Beaumaris Zoo’s former occupants still haunt the unused grounds, perhaps contributing to the ongoing disuse into the 21st century. Tasmanian born and bred, Josh Mitchell is a freelance copywriter whose travels continue to take him on adventures around the world, before each time returning back home for mental, emotional and spiritual refreshment here in Tasmania’s idyllic surrounds. Fulfilling his true passion toward fiction, he is currently working on his debut novel. You can follow Josh on social media, @MidnightQuills or visit his website, midnightquills.net for more of his work. I would like to see Bonorong Park relocate to Beaumaris, and expanded to include a large part of the Domain and a thylacine museum. We’ve got two cool new walkways, so we may as well provide something to walk to! I have suggested to Holly and Josh that it could make an ideal place for the homeless, shipping container style to allow transportability. These could sleep 20 people if done right .. or is that not conservation enough?